It's Pong but without walls to bounce the ball off. I was expecting it to wrap but this is so much cooler. Liked the idea, however it would be awesome if there was some rudimentary AI to play this against. this game is really incredible simple idea but with hard work great game well done. If you wnated to you can go check out my entry it will be nice from you don't forget feedback and rating. Cool. I like that it makes hitting the ball at steep angles more risky, but you need to do it in order to score. Or just wait for your opponent to to mess up. 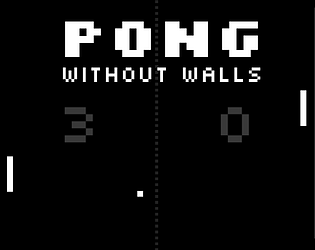 Really simple but nice twist on Pong. I like how you added more precision on the ball direction when you hit the ball. This is simple but crucial to make the concept work. Like the simplicity but I think you can improve on it! Cool twist on a classic. I love the 2-player, played it with my wife and it was really fun.